Tom McCarthy in Bruce Graham’s play THE PHILLY FAN at the Montgomery Theater. Photo credit: Angela McMichael. The time is so ripe for THE PHILLY FAN’s return. Though Bruce Graham’s play is set on the eve of a potential Philadelphia sports triumph — Super Bowl XXXIX which pitted the Eagles against the New England Patriots — it more often chronicles the long-suffering, patiently impatient diehard who supports local professional teams that, among them, earned six championships in the last 50 years while disappointing mightily on multiple occasions and setting ignominious records for failure, loss, and just missing the bus. 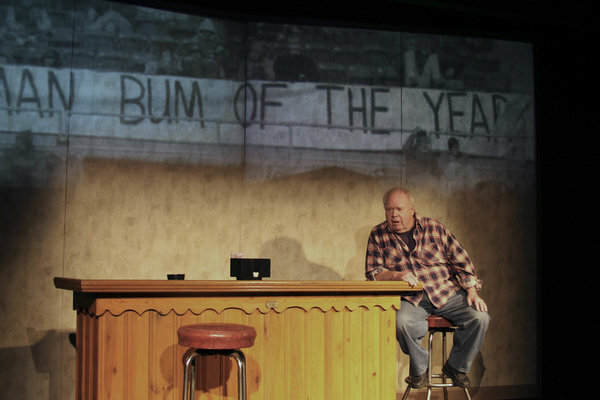 As written by Graham and portrayed by Tom Carthy, whose idea spawned this 2005 play, the Philadelphia sports fan is no fair-weather enthusiast. He and she are in there, game in and game out, root, root, rooting their lungs raw, hearts unabashedly on their sleeves, boos emerging from their booze-slaked throats. The show is set on the February 2005 day before the Super Bowl. The Eagles were never considered a favorite in the contest, not like they were in 1981 against the Oakland Raiders. McCarthy’s fan is already anticipating a loss while praising Donovan McNabb, Andy Reid, and Terrell Owens, soon to be one more sad case in Philadelphia sports annals, but someone The Fan, on the afternoon we meet him, is thrilled to have signed to a six-year contract. The beauty of Graham’s play is it works whether Philadelphia teams are contending or, as is the current case, finding new ways to embarrass their fan base. McCarthy’s character, simply called The Fan, is no sad sack. He can recall victories and extol everyone from Chuck Bednarik to Cole Hamels, but he also remembers wresting defeat from the jaws of victory and the teams that were barely worth their uniforms. And he knows what a morass Philly teams face in 2016. Tom McCarthy’s Fan doesn’t wallow in pity. He shows how sympathy might be warranted, but he is too ironic to feel sorry for himself. His emotions are reserved for negative-shake-of-the-head resignation, his attitude one of ridicule for the bums that have owned or managed Philly franchises. Under Joe Canuso’s direction, McCarthy fluidly goes through the woes, joys, and habit of the Philly fan. Canuso keeps Graham’s show running smoothly and energetically. There’s never a lull in action and never a time when McCarthy, Graham, and Canuso don’t find a way to command your attention. Best of all, THE PHILLY FAN centers on sports but isn’t confined to it. Graham finds the pulse and humor in the city. McCarthy’s Fan suggests all things Philadelphia: the local custom of joking at someone else’s expense and looking at everything through jaundiced-tinted glasses that spark well-honed sarcasm and attitude as home-bred and indigenous as an Amoroso roll or Tastykake. THE PHILLY FAN is funny and entertaining to high degrees, but it is also warm and insightful. McCarthy finds the right tone in speaking about his late wife, Roe, and the guy who was his sports companion for more than 50 years. He talks in regular-guy terms about being a father and about his relationship with his grandson. You see The Fan as a total human being whose sports enthusiasm is part of a larger life that includes family, a job, friends, and mouthing off at the bar with buddies he’s known since Billy Penn stopped in to order a nice, cold mead. And to the Dallas rooter, who is learning Philly manners from a guy who is a textbook example of them. The energy and variety of McCarthy’s performance belie the news he is nearing age 80. He projects experienced middle age and has the youthful outlook of a guy who is waiting for something happen, e.g. more parades down Broad Street to for Philly teams. McCarthy, Graham, and Canuso show their audience a complete person who can appeal to a general audience. Within this person is that passionate, disgruntled, hopeful, despairing Philadelphia sports fan who regularly sees promise and potential dashed and bears it with a loud, opinionated brand of stoicism. Along with some pointed boos. Being a Philly fan is a great lesson in resilience. So what if we’re usually cast as one of those inflated clowns that bounces up to be clobbered anew. We face our fate with grit, boos, and joke-laden mortification. No set designer is listed, but THE PHILLY FAN moves neatly from a bar that dominates center stage to The Fan’s stage righ living room, where no one is permitted to sit in the spot occupied for years by his primary sports buddy, and some bleacher seats that resemble old Vet seats, to the left. The Fan’s fate on Father’s Day 1964, when Jim Bunning pitches his perfect game, is priceless and the underscores the reality and human nature of Graham’s story. [The Montgomery Theater, 124 Main Street, Souderton, Pa.] February 11-March 6, 2016; montgomerytheater.org.